Bruges is famous for two reasons – beer and chocolate. And a weekend in the city cannot be complete without sampling both…in copious amounts. But after three short days there, I soon realised there so much more Bruges has to offer to whet your appetite! From our trip, I managed to create my top three places to rest your weary legs, quench your thirst and satisfy your chocolate cravings. If you’re paying Bruges a visit, these are well worth the pit-stop. Dodge the tourists traps around the Markt Square and Belfry Tower and head outwards, you’ll be rewarded for wandering a little out of town. 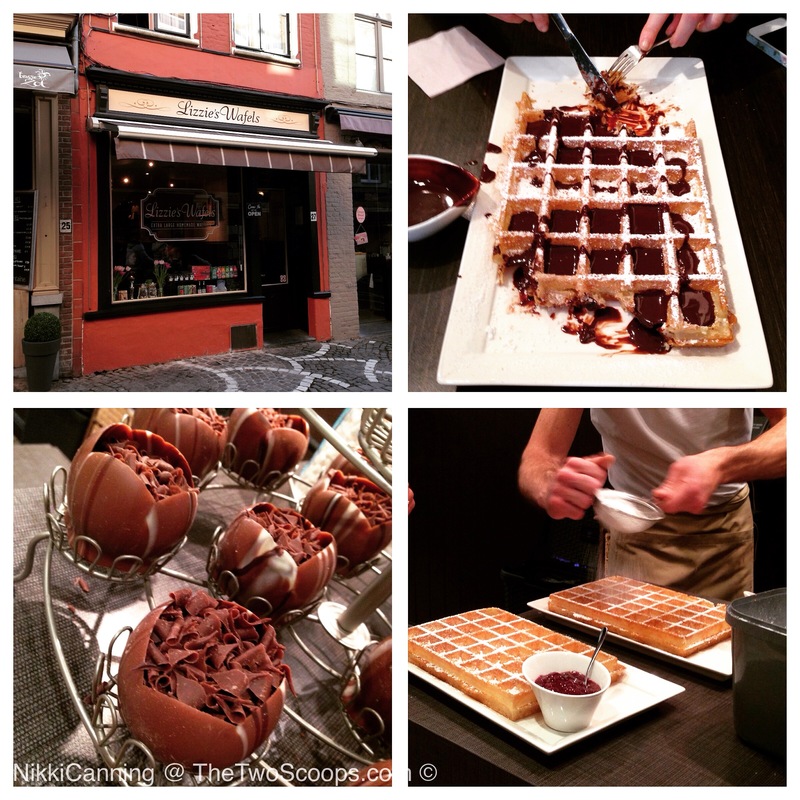 Situated just off Markt Square you won’t have to wander far to find the best waffles in town. 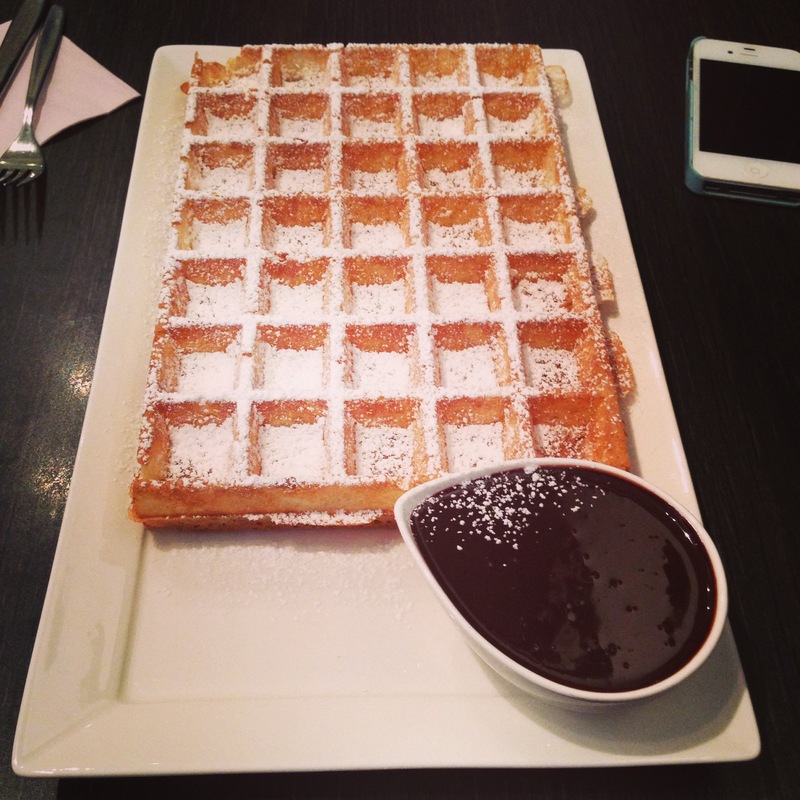 Around the city there are plenty of waffle vans offering up waffles-on-the-go but if you really want to have the ultimate Belgian waffle experience, head to Lizzie’s. This dinky family run business serves up the biggest waffles I have ever set my eyes on, and they do not disappoint. Choose your waffle and then choose your sides – everything from vanilla ice-cream, whipped cream, sliced bananas, strawberries, caramel, warm cherries and even eggnog! We opted for the traditional homemade chocolate sauce which was just decadent – thick and rich, we made easy work of mopping up all the chocolatey-goodness with the crisp waffles! You could easily order one between two, but if you want to add a lil extra chocolate factor to your stop-off, ask for the hot chocolate! A tall glass of warm milk arrives with a handmade tulip of chocolate (milk, dark or white chocolate). You drop the tulip into the milk and watch the chocolate melt – the result? Hot chocolate winter days are made for! Looking on the map, you might think Pro Deo was a bit of a trek out of town for some dinner, but trust us, it’s about 10 minutes walk and it is definitely worth it. Pro Deo – which means a lawyer who works for free for the poor – is a small, quaint Bistro along the Langestraat. The building was built in 1562 and restored in 1713, and because of it’s location next to one of the nine city gates of Bruges, it’s a hub where both locals and tourists mix to enjoy traditional Belgian cuisine. The family run Bistro – chef Kristof mans the kitchen and his partner Natalie is the sweetest hostess front of house – opened its doors in 2007, and decorated the restaurant in a quirky, hipster style that wouldn’t be out of place in London’s Shoreditch or Brooklyn, New York. We tucked into complimentary olives and spicy popcorn as we drooled over the menu. Eventually we settled on mains of fresh Dover sole and scampi (done the traditional way, without being breaded and deep fried) and a gooey chocolate molleux for dessert. There is only one table sitting each night, and with only nine tables in the whole restaurant, be sure to book ahead. This is truly a place where the locals know and love. 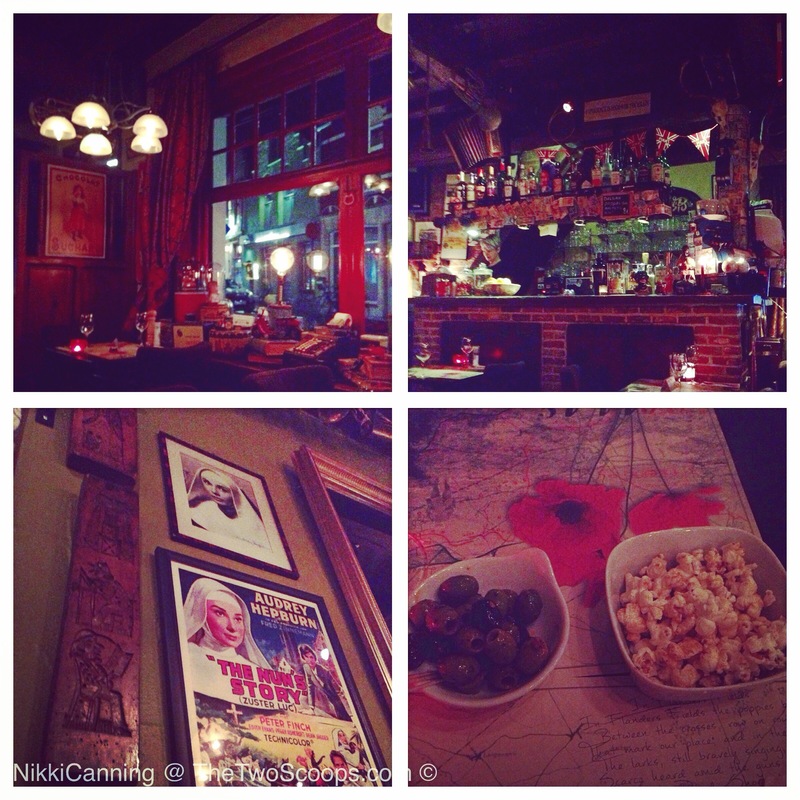 Although it’s just off Markt Square, expect to find cosy sofas, roaring fires and a menu that won’t break the bank. ’t Hof van Rembrandt lies in the corner of Eiermarkt, and we managed to pop in three different times in three days – we couldn’t beat their mulled wine (served with chocolate of course!) and fireplaces for warming up our chilly fingers and toes. Upstairs, the restaurant serves great, wholesome food and offers up a bird’s eye spot for some people watching. We opted for a hearty omelette and a croque monsieur that was oozing delicious melted cheese for lunch. Of course, a Belgian Brasserie wouldn’t be complete without an extensive beer menu, and het Hof van Rembrandt doesn’t disappoint. It has pages of both draught and bottled, blonde or dark, beer to choose from and a ‘staff’s choice’ beer of the month. We opted for a beer on the Christmas specials list on our first visit – Bush Noel, a blond draft beer which turned out to be 12% ABV!! Needless to say, the bar snacks we’re very welcome after our first glass! Have you been to Bruges? Let us know your favourite places to eat and drink in the comments below! 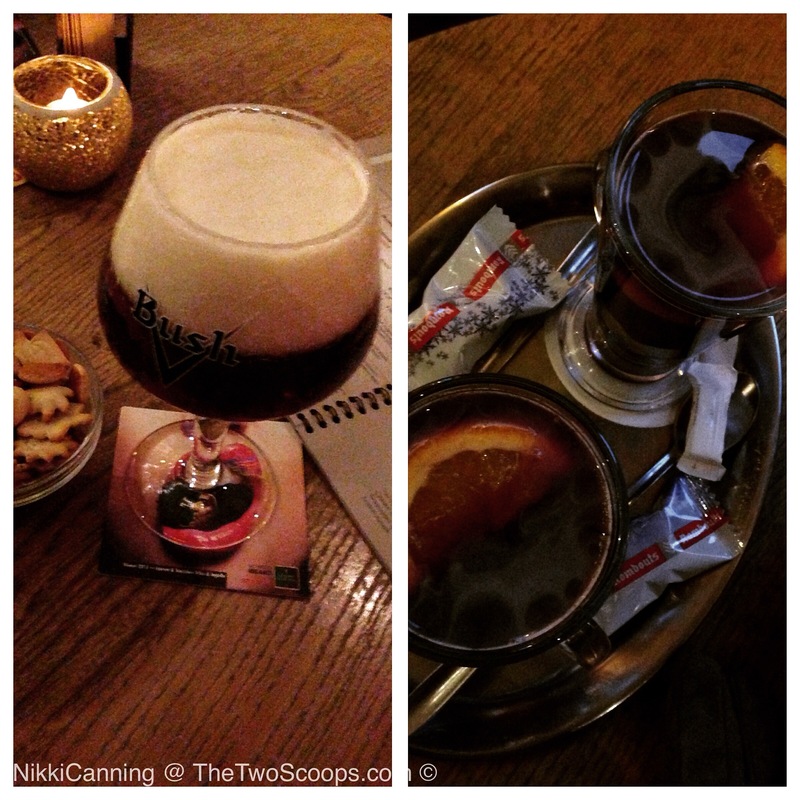 For more pics of Bruges and other travels – follow us on Instagram @TheTwoScoops. I haven’t been to Bruges for years but it’s a lovely city and these sound like great places to eat. Aw I definitely fell in love with it! 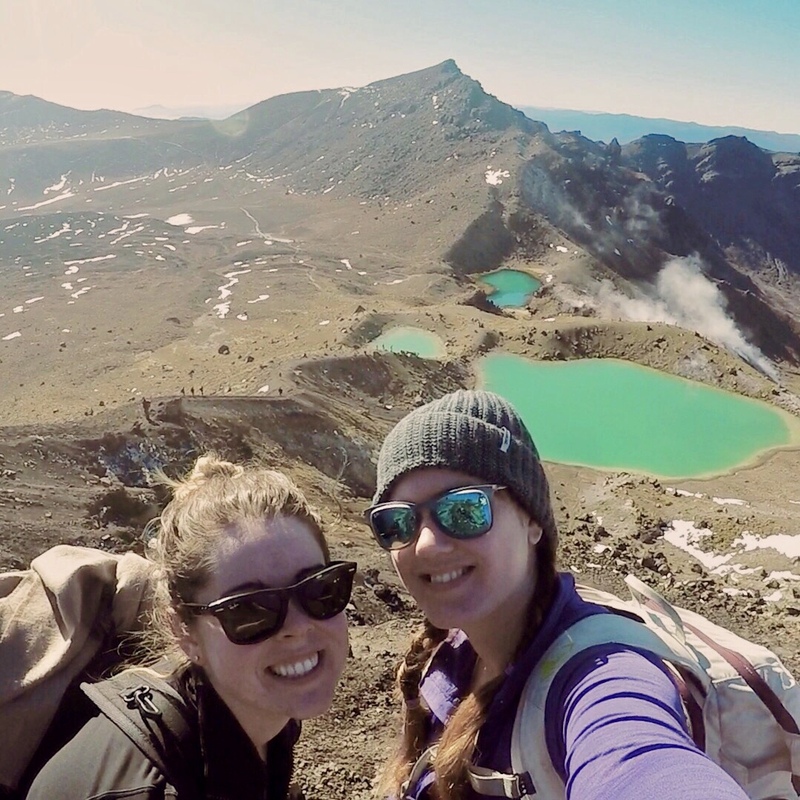 Hopefully you’ll get to return soon – the waffles alone were worth the trip!